Definition at line 18 of file whrlpool.h. Definition at line 28 of file whrlpool.h. Definition at line 142 of file whirlpool.cpp. Definition at line 23 of file whrlpool.h. Definition at line 12 of file whirlpool.cpp. 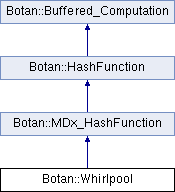 References Botan::copy_out_vec_be(), Botan::get_byte(), Botan::MDx_HashFunction::hash_block_size(), Botan::load_be(), output_length(), and Whirlpool(). Referenced by Botan::MD4::copy_state(), copy_state(), Botan::MD5::copy_state(), Botan::RIPEMD_160::copy_state(), Botan::SM3::copy_state(), and Botan::Tiger::copy_state(). Definition at line 21 of file whrlpool.h. Definition at line 22 of file whrlpool.h.